PHOTO CAPTIONS: 1. 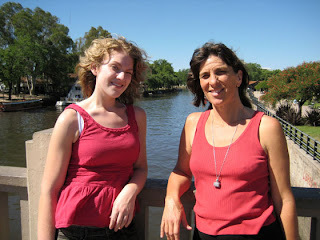 My cousin Julie's daughter Gannon with me at Tigre, AR, 2. the boat to Uruguay from Tigre, 3. 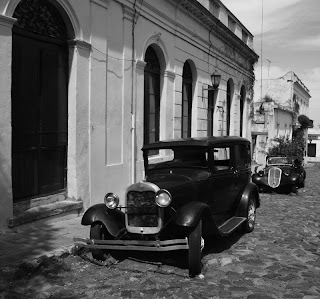 Antique cars are common in Colonia, UR, 4. The historic zone of Colonia, UR. Just in the nick of time I found out that my cousin Julie's 18-year-old daughter Gannon is staying in Buenos Aires for 3 months. She's teaching English to 5th graders and looking for an internship as well. She arrived on Tuesday, but her mom thought that Andre and I had already left Buenos Aires, and my cousin Zak in Chile was still using my hotmail address which I almost never check. Once we got that straightened out, Julie gave me Gannon's phone number and I called right away. Luckily Gannon had Monday free, so Andre and I postponed our boat trip to Uruguay to spend the day together. I couldn't be more impressed by Gannon. She's really grown up into a beautiful young woman, very poised and educated. She's fluent in Spanish, like practically everyone else on my mother's side of the family. My uncle was in the United Nations back in the 1970s, so my three cousins grew up in Argentina and Chile. Zak has been living in Puerto Montt, Chile for the last several years, so Andre and I hope to visit him there in a few weeks. His Chilean girlfriend Soraya and I have been writing emails and skyping for quite some time; it will be great to finally meet her. They have plans to sell their goat ranch and move to New Zealand after the new year. Even though Gannon has only been in Buenos Aires less than a week, she gets around the city easily. She's boarding with other students far from downtown, so she volunteered to meet us at our hotel in San Telmo district. 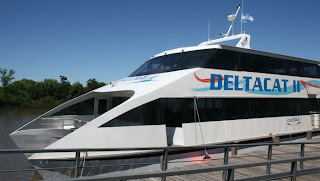 Andre and I wanted to get our boat tickets in advance, so we suggested the train ride out to El Tigre which we did last week with Jean and Ronald. Again we did lots of walking. Like me, Gannon loves to walk, not only for the exercise but also to see more. I don't know many American teens, right out of high school, who could travel to a foreign country on their own and be as self-assured as Gannon. I think she made a wise decision to postpone college for a year to travel first. Gannon mentioned that some of her family may be coming down for the holidays. That would be a great opportunity for Andre to meet more of my family. It's only fair since I've met most of his in Haiti. But it would mean skipping Rio and Bahia, Brazil, which we'd saved for the last two weeks before our return flight from San Paulo to Santo Domingo on Jan. 3. I can't believe how quickly the time is going. Originally I thought 2-1/2 months would be a long leisurely trip, but once we got down here we realized how great the distances are. Today we took a 2-1/2 boat ride from El Tigre to Uruguay. The first thing I noticed is prices aren't as cheap as in Argentina -- particularly here in touristy Colonia. As Andre said, this is the most beautiful colonial zone he's ever seen. So far he's been to the historic districts of Santo Domingo, Sao Paulo, Curitiba, and Buenos Aires. Colonia really is photogenic. We took some pictures at sunset tonight.